Product prices and availability are accurate as of 2019-01-19 04:20:16 GMT and are subject to change. Any price and availability information displayed on http://www.amazon.com/ at the time of purchase will apply to the purchase of this product. The Kiss My Face Cool Sport Cream Suncreen SPF 30 is developed to secure the face and neck from sunburn without obstructing pores or annoying delicate skin. Natural Antioxidant Defenders, such as aloe, cucumber, and green tea, keep your skin nourished and hydrated. 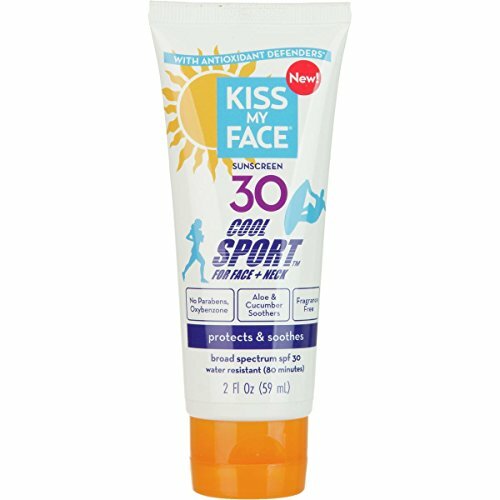 In addition, this face and neck-specific sun block is water-resistant for 80 minutes, making it a great choice for beach days and seaside vacations.